Greg Alexander likes to challenge himself physically, emotionally, and mentally—on and off the bike—and learn how to overcome those challenges safely, effectively and comfortably. Work brought Greg and Betty-Anne Alexander to the Cold Lake/Bonnyville area of Edmonton, 300 km northeast of Edmonton more than twenty years ago. It’s been the starting point for many long-distance rides. Greg learned to ride around his dad’s farm on a Tote Gote—a three-horse-powered vibrating Briggs and Stratton powered mini-bike designed for hunters to haul deer out of the mountains. 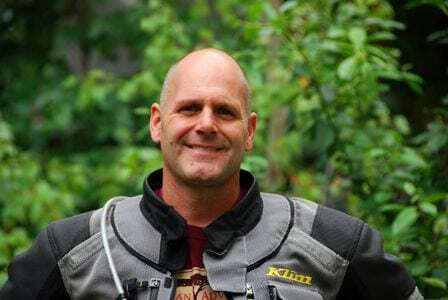 Since then he’s worked up to a Honda Gold Wing, a cadre of adventure bikes, a trials bike, and occasionally Betty-Anne’s sidecar. He enjoys riding gravel more than pavement, something he’s had plenty of opportunity to do on trips to the Arctic. “I’m an introvert, yet meeting other people adds a lot to the trips. Learning to deal with the weather is another challenge. As someone from northern Alberta, I had to learn how to manage the forty-degree (C) heat during the Three Flags Classic (a six-day annual ride from Mexico to Canada). 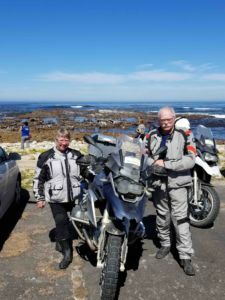 He didn’t know what to expect when he signed up for the Victoria Falls to Cape Town ride. 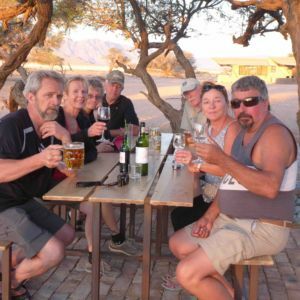 At one lodge in Botswana, he joined a conversation with a local judge at the only Wi-Fi hotspot at the site. “She explained their family and cultural values. She’d been to Victoria, British Columbia, and we talked about the differences in how we value family. “She described the plots of land we’d seen where one would belong to the parents, another the children, and another the grandparents, with the tribal grounds beyond that. She admired our freedom—that we’re not socially bound to our parents and grandparents and can move and follow our jobs. 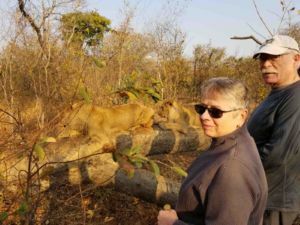 “In Victoria Falls, a conversation with the woman at the counter in the lodge really hit home as to how comfortable we have it. “It was interesting to learn about the roots of apartheid in Cape Town. I wish I had read up on my history before going so I had more background knowledge.